The Google Home line of products features interactive speakers of various shapes and sizes which are controlled by Google Assistant, a voice-driven service that responds to a seemingly endless amount of commands. In order to get Google Home to listen to these commands, however, you first need to connect it to a Wi-Fi network. Before taking the steps below you should have your wireless network's name and password handy. You should have already downloaded and installed the Google Home app. If not, do so via the App Store for iPhone, iPad or iPod touch devices and Google Play for Android. Launch the Google Home app, if it's not open already. Select or enter the Google account that you wish to associate with your Google Home device. If prompted, enable Bluetooth on your Android or iOS device. Your new Google Home device should now be discovered by the app. Tap NEXT. The speaker should now make a sound. If you heard this sound, select YES in the app. Select the location of your device (i.e., Living Room) from the list provided. Enter a unique name for your smart speaker. A list of available Wi-Fi networks will now be displayed. Choose the network that you wish to connect Google Home to and tap NEXT. Enter the Wi-Fi network password and tap CONNECT. If successful, you should see a Connected message appear following a brief delay. If your Google Home speaker was already set up but now needs to be connected to a different Wi-Fi network, or to an existing network with a changed password, take the following steps. Open the Google Home app on your Android or iOS device. Tap on the device button, located in the upper right-hand corner of the screen and circled in the accompanying screenshot. A list of your Google Home devices should now be shown, each one with its user-specified name and image. Locate the device that you wish to connect to Wi-Fi and tap its menu button, positioned in the upper right-hand corner of the speaker's card and represented by three horiztonally-aligned dots. When the pop-up menu appears, select the Settings option. Scroll down to the Device settings section and tap on Wi-Fi. The Google Home device's Wi-Fi settings should now be visible. If currently connected to a network, select FORGET THIS NETWORK. A pop-up will now appear, asking you to confirm this decision. Choose FORGET WI-FI NETWORK. After the network is forgotten, you'll be returned to the app's home screen. Tap the device button a second time. A set of instructions will now appear, prompting you to navigate to your Android or iOS device's Wi-Fi settings and connect to the customized Google Home hotspot that appears within the network list. This hotspot will be represented by a name followed by four digits or by the custom name that you previously gave to your Google Home device during setup. Return to the Google Home app. The speaker should now make a sound. If you heard this sound, select YES in the app. If you've carefully followed the above instructions and still can't seem to connect your Google Home device to your Wi-Fi network then you may want to consider trying some of these tips. Try restarting your modem and router. Try resetting your Google Home to factory settings. This can be done by holding down the microphone button, typically found on the bottom side of the device, for approximately 15 seconds. Make sure that your Wi-Fi password is correct. You can confirm this by trying to connect another device using the same password. Try updating the firmware on your modem and/or router. 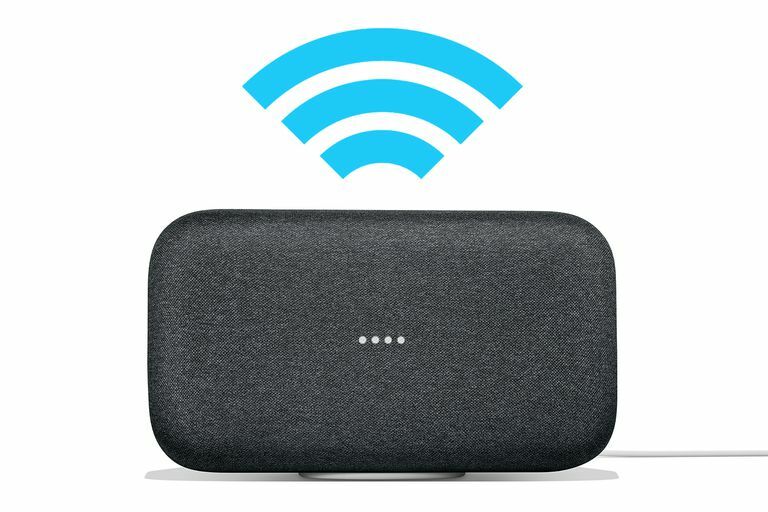 Move your Google Home speaker closer to your wireless router. Move your Google Home speaker away from possible sources of signal interference, such as baby monitors or other wireless electronics. If you're still unable to connect, you may want to contact the device manufacturer and/or your internet service provider.